A country resort is one thing, but a country resort on the water? Yes, please. 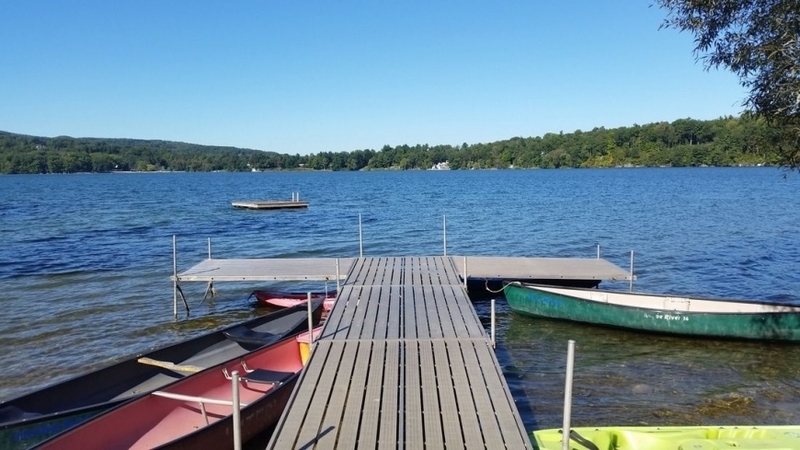 At Interlaken, you’re steps away from Lake Wononscopomuc, Connecticut’s deepest natural lake. Pull up a lounge chair and unwind at the water’s edge, or let yourself drift in the literal sense — we provide canoe and kayak rentals to our guests at no additional cost. You can row to your heart’s content from Memorial Day weekend through the end of September. Interlaken is surrounded by vibrant, “English Cottage” style gardens landscaped by the Salisbury Garden Center. Taking a peaceful jaunt through these alluring meadows is a must, where you’ll also come across giant sculptures crafted by Denis Curtiss. Most of these statues resemble some form of fauna that you may encounter in the Litchfield Hills — deer, galloping horses, and Peter Cottontail himself. When the sun is shining, it’s always refreshing to let loose and relax in the great outdoors. Thirty acres of scenic, spacious lawns surrounding Interlaken make the perfect setting for a morning jog, frisbee tournament, or a family picnic. You’ll also find a basketball court, volleyball net, and even a designated area to practice your golf swing before taking to one of several golf courses in the Lakeville area. Outside of our Sunnyside House, you’ll find a giant hill, perfect for sledding in the winter or for the kids to roll down in the warmer months. Whether Mother Nature is raining on your outdoor plans or you’re just looking for a proper way to wind down after a busy day, you’ll want an indoor spot to entertain yourself. Pool, ping-pong, air hockey, and a wide-screen TV surrounded by overstuffed chairs are just a few ways to enjoy a cozy night in. The Executive Lounge stands out with its distinct personality and charm. While many resorts can feel a bit cookie-cutter in their amenities, it’s easy to fall in love with Interlaken’s elegant architectural detail and clubhouse feel. ?As you’re searching for a country resort, consider how you’ll fill your itinerary. There’s plenty to keep you entertained here at Interlaken, but this is just the tip of the iceberg when it comes to activities and attractions in the Litchfield Hills area. We’ll be more than just your go-to Connecticut resort — we’ll be your resident travel experts for the Litchfield Hills and the Berkshires.